The Xperia S uses the traditional droid Gallery, which hasn't really seen much change in Gingerbread. It has good functionality, cool 3D looks and nice transition effects, but only shows a downsized version of your images. Facebook and Picasa albums show up in the Gallery too. They are distinguished by the small logo of the corresponding service. Facebook pics can be "liked" with the thumbs up button in the upper right corner. The BRAVIA engine enhances contrast and colors by sharpening the image and reducing noise. These steps would normally lead to artifacts, but the high-density screen of the Xperia S makes them invisible. You can switch BRAVIA off, but we recommend keeping it on - it really improves the image quality. There is no dedicated video player app on the Xperia S as in most of the droids out there. Unlike previous Xperia phones, the video player of the Xperia S supports AVI and MKV videos in addition to the usual 3GP and MP4 videos. There are some limitations though - some audio codecs were causing trouble. According to one of our readers, its the videos with surround sound that Xperia S users should avoid. To its credit, the Xperia S did play a 1080p videos and the 4.3" Reality display offers excellent image quality (the BRAVIA engine comes into play here too), plus you can watch 720p videos at 100%. If you re-encode your videos beforehand, the Xperia S can make a good PMP. Or you could just download a capable video player off the Android Market and make your life easier. There are excellent free players out there, which will address other deficiencies of the Xperia S video player, like the lack of subtitles. The music player on the Xperia S has been rebuilt from the ground up. You're welcomed to a Cover Flow-like interface and you can swipe left and right to skip tracks (complete with a smooth 3D effect). In the Now playing interface, there's the familiar Infinite button - it gives you quick options to find the music or karaoke videos on YouTube for the current song, look for more tracks on PlayNow, search Wikipedia for info on the artist or look for lyrics on Google. New features can be added to this menu with extensions available in the Play Store. SensMe should be familiar to everyone who owned one of those old Sony Ericsson Walkman phones. If you haven't, SensMe organizes songs by mood. By default, there are nine "channels" - daytime, energetic, relax, upbeat, mellow, lounge, emotional, dance and extreme. Audiophiles will appreciate the rich selection of equalizer presets. There's a custom preset too - it lets you adjust five frquency bands and there's a Clear Bass slider too. The More tab offers a Headphone surround option, which can be set to Studio, Club or Concert hall. If you're not using the headphones, you can turn the xLOUD feature on, which optimizes the sound for the Xperia S loudspeaker. 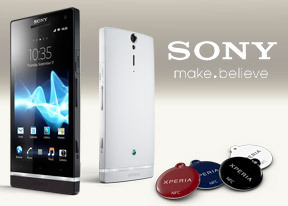 The Sony Xperia S is also equipped with an FM radio, which has a really neat and simple interface. It automatically scans the area for the available stations and places "notches" on the frequency dial for easier scrolling to the next station. There's a Force mono option to use in situations of poor reception. The Sony Xperia S performed pretty well in the first part of our traditional audio quality test. The smartphone got very good scores all over and garnished them an average volume levels, making up for one of the better performances we have seen. 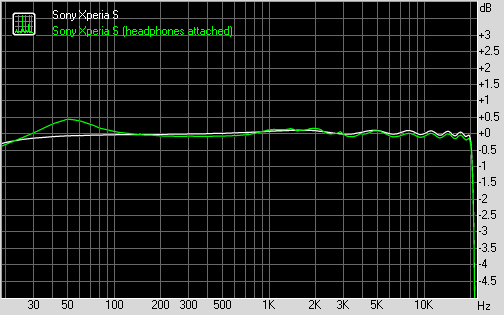 There's some degradation when you plug in a pair of headphones, but things certainly aren't too bad. The stereo crosstalk rises noticeably and some distortion creeps in. Volume levels remain about the same, though, which is not a common sight among smartphones. A solid overall performance, which should please anyone but the most demanding audiophiles.